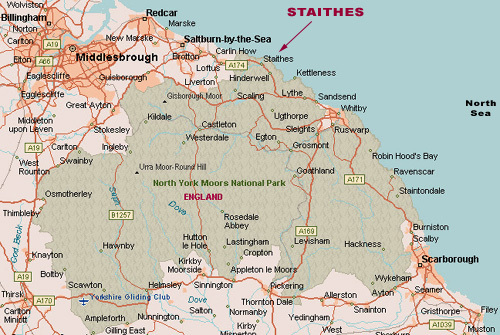 This map shows Staithes in relation to the North Yorks Moors National Park. Staithes is on the coast, north of Whitby and south of Redcar. The old town of Staithes, where the gallery is situated is at the foot of steep incline. It is one of those fascinating places to visit which is not busy with cars. We encourage visitors to use Bank Top car park as indicated on the map. Staithes Gallery is located at the foot of the hill on the High Street. You’ll pass the Captain Cook Museum on the right. You really can’t miss Staithes Gallery as it is the biggest window frontage in the town. We are just opposite the car park of The Endeavour restaurant. 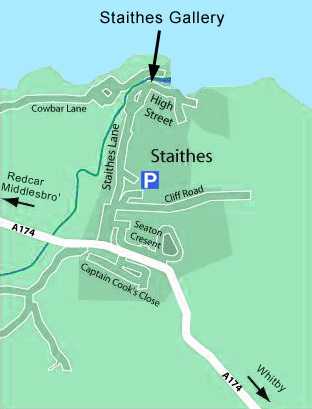 See Multimap for another map of Staithes.